If you live in Greensboro and have ever put a shovel to soil, you know that our landscape is filled with CLAY. Given its abundance, Greensboro is steeped in the tradition of throwing clay into vessels. We have several local potters and pottery studios. Additionally, Jugtown and Seagrove are located a little over an hour south of Greensboro. In the photo above, you see one of the red glazed pieces made famous in the murder mystery novel, Uncommon Clay, written by North Carolina writer, Margaret Maron. If you are committed to the "buy local" movement or want to give a gift that represents our region, you can't go wrong purchasing North Carolina pottery (or books about NC pottery!). We use ours every day! Oh we know all about CLAY down here as well. What gorgeous pottery and the colors are beautiful. I want to come shop. Thank you Virginia. Regarding the colors, we took this pottery photo on the day of the inauguration when everyone was in a patriotic mood. We plan to feature NC pottery more in the upcoming months so, do stop back! Many different glazes and styles are available. Most potters have glazes that become their signature styles. Thanks for the post on Seagrove Pottery. 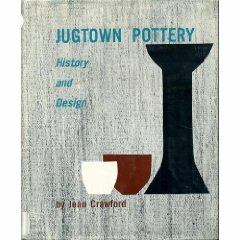 I would like to add that the North Carolina Pottery Center sells copies of most of the books you have listed. They are a museum and information center in the downtown area of Seagrove. Another place to gather information about Seagrove is from the http://www.discoverseagrove.com website. Very appreciated and well done post. At the North Carolina Pottery Center you can see a few pots of the local Seagrove potters, pick up a Seagrove Potter's Map and plan an excursion through the country side to visit the potters. There is an exhibition at the North Carolina Potter Center that is a must see called Owen/Owens : 175 Years of a Family Business. The Discover Seagrove website that Meredith mentioned is also a good place to find out the various pottery events taking place in Seagrove. There will be kiln openings coming up in April so check back often for new updates at www.discoverseagrove.com! Thanks for the coverage. I'd like to plug the NC Pottery Center as well. It's a fine facility, located one block away from the main intersection (with the world's quickest stoplight) in Seagrove, worth a visit. They have a nice display of current works by Seagrove potters as well as ongoing exhibits of potters from throughout North Carolina. What beautiful pottery! And what a nice tribute to our new president. Thank you! I'm coveting that red jug. What a pleasing shape, and the colour just zings on a January day. How wonderful that so many people from all over the world are reading and commenting on today's post. This sense of community is precisely what we are trying to build with Greensboro Daily Photo-- local people and people worldwide appreciating what Greensboro and North Carolina have to offer. Thank you Seagrove for responding with additional resources for readers! The only thing that could make the blogging day any better would be a comment from Margaret Maron! Thanks for stopping by! Please come back! I just wanted to stop by to say that this blog is GREAT!!!! I wish you all the best things in 2009!